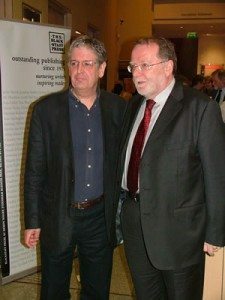 Edited by Professor Gerald Dawe of Trinity College, Dublin, this publication was supported by the Military Heritage of Ireland Trust CLG, and was launched on the 11th November 2008 in Collins Barracks, Dublin by Mr Cathal Goan, Director General of RTÉ. 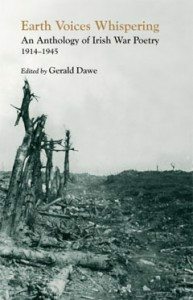 It puts together in one volume, for the first time, experiences of the first and second world wars, as well as conflict in Ireland – the Easter Rising, War of Independence, the Irish Civil War – and the Spanish Civil War, in addition to various contemporary reflections on these events. On left, Prof. Gerald Dawes with Mr. Cathal Goan, Director General R.T.E, at the launch of Earth Voices Whispering. ‘Here is L. J. Fennessy whose poem Twenty Four wonders what fate awaits his “loveable, laughable, wild unruly crew” of army comrades, never realising that 14 of them would die with him in an accidental training mine explosion in the Glen of Imaal in 1941. But this is the joy of Dawe’s expansive anthology. Here is an editor with no axe to grind, with no agenda beyond a desire that forgotten voices should be heard.’ ‘This remarkable and constantly surprising anthology is a perfect gift for anyone interested in Irish poetry or in how Irish writers engaged with the conflicts of the 20th century and with their legacies’. BY COL. W.R.H. CHARLEY O.B.E. 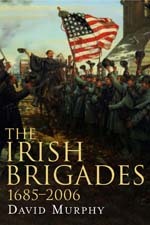 “The Irish Brigades, 1685-2006, a gazetteer of Irish military service, past and present”, researched and written by Dr. David Murphy and published by Four Courts Press (2007), was commissioned by The Military Heritage of Ireland Trust CLG. Our Newsletter for December 2007 carries the announcement of the publication. The following review of the book has been submitted by Colonel W.R.H (Robin) Charley O.B.E., Honorary Treasurer of the Somme Association. War and Security Studies Seminar – Spring 2009 series. lessons from Afghanistan and Iraq. Countering the threat posed by IEDs. The challenge from recent operations. The mediatisation of security policy: the implications for defence planning. Neutrality: changing concepts and different practices, 1408 – 2008. Dr David Murphy, Dept of History, NUI Maynooth.